Once the cake was done and cooled I added the icing. Next, we emptied all the Oreos into a ziploc bag except for 6-7. Then we smashed them with a hammer to mash them up. The seven that we kept aside we smashed in a baggie too and when those were all smashed up we added a few drops of green food coloring to the bag and mixed it up. 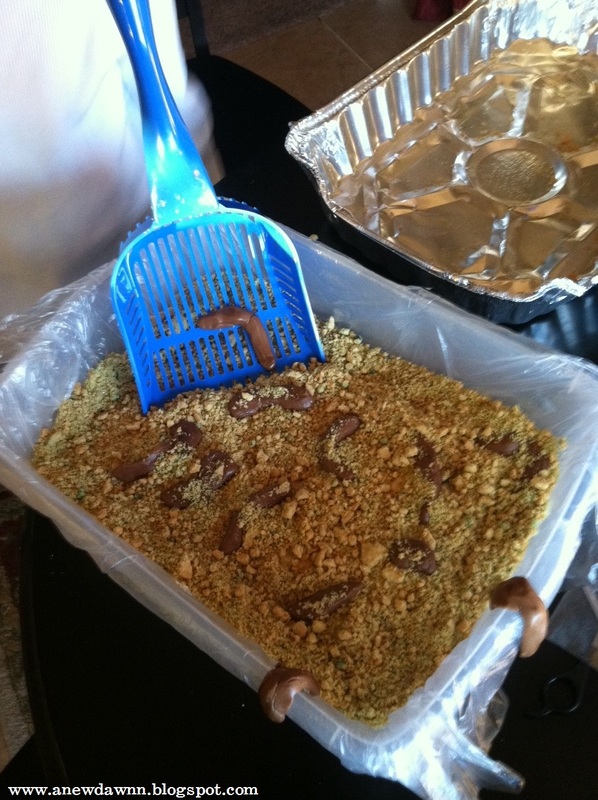 ﻿ Once that was done we mixed up both bags of crumbs in a bowl and then spooned it on top of the cake to look like litter. 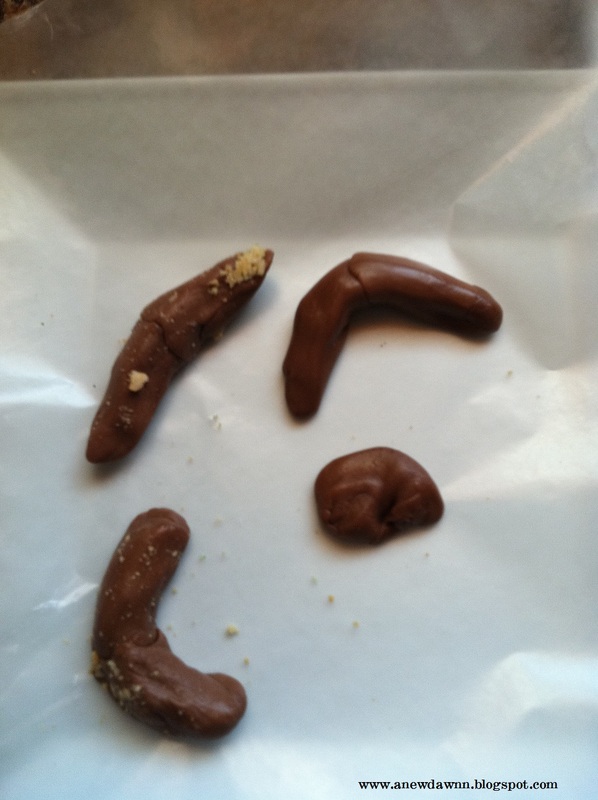 Now to the fun part….the cat poop! I lined up about 12 mini tootsie rolls on plate and microwaved them for about 10 seconds on 50% power. That made them soft enough to mold (if they are not soft enough just add another 10 seconds) and we just shaped them into a cat poop shape. We did this a few times until we had enough turds for the cake. Once they were added to the top, I set the pan inside a clear container lined with a clear trash bag I had to look like the litter box (I had a real hard time finding a small litter box. The only ones I could find were really big and I didn’t want the cake pan to be that noticeable. ﻿ Finally I added the pooper scooper (a brand new one!!) to the side with a tootsie turd on it and we were done!! All in all very easy to make and very gross to look at but the kids loved it!! 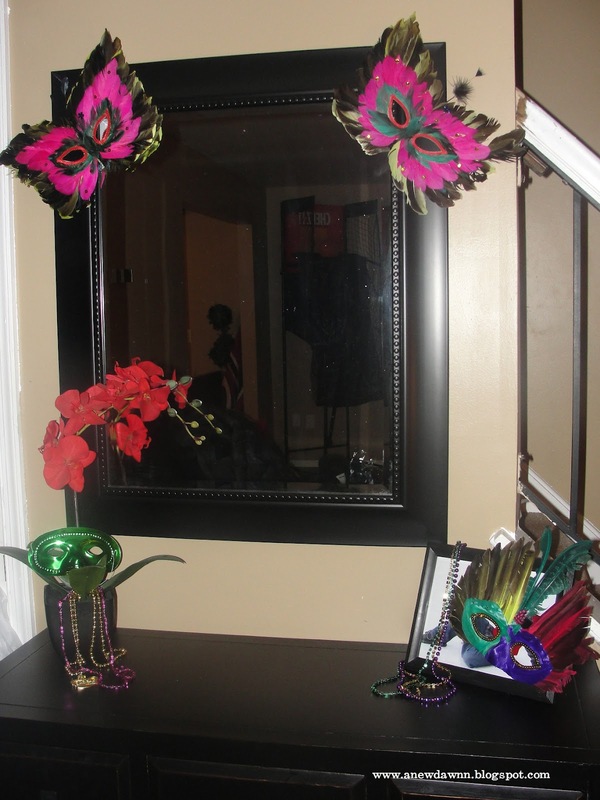 Now that Valentine’s Day has come and gone….it is time to start decorating for the next occasion….MARDI GRAS!!! I love to decorate my house and have theme dinner parties….I will look for any excuse to do it. 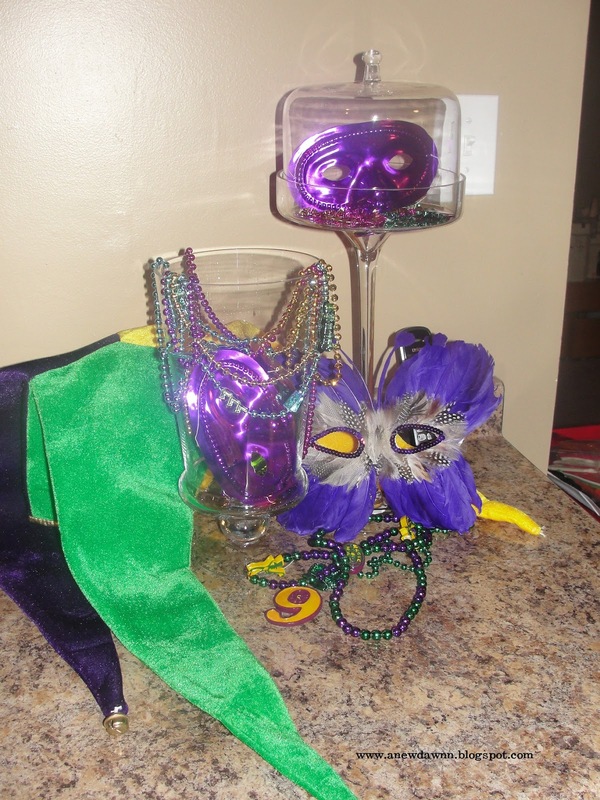 Although I don’t go all out for Mardi Gras…I do have a dinner planned and I do a little decorating. Here is my hall table and counter in my kitchen spruced up for the occasion. I absolutely LOVE my new tall cupcake dish! I found this at TJMaxx and am so excited to be using it. There were 3 sizes…the tall, a medium one and a small one. Unfortunately for me, they only had this one left. So I have to hunt down the other too….but for now this works. Yesterday was our school’s 100 Day Celebration and I was in charge of a snack. I knew I didn’t want to do cupcakes because I sent in cupcakes for the Valentine’s Day party today so I went with cookies instead. 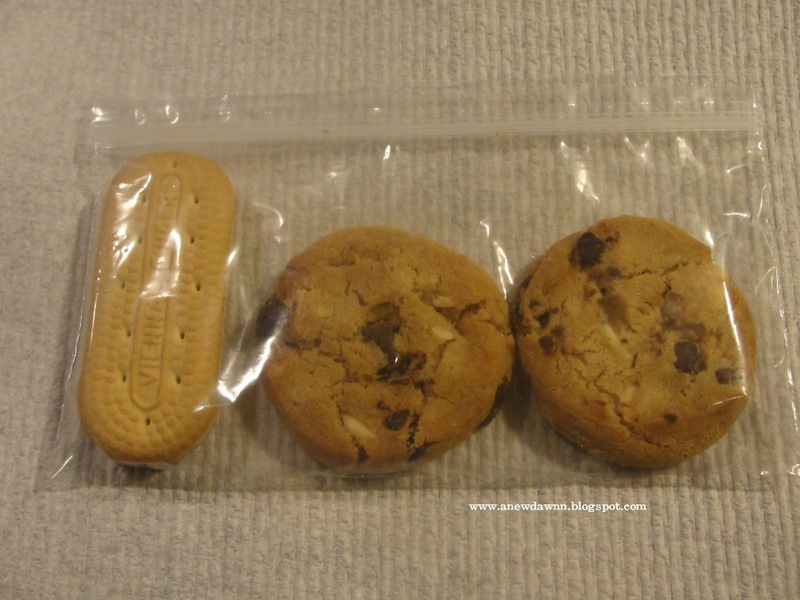 I wanted the cookies to look like a 100 so I picked Vienna Fingers and Chips Ahoy. 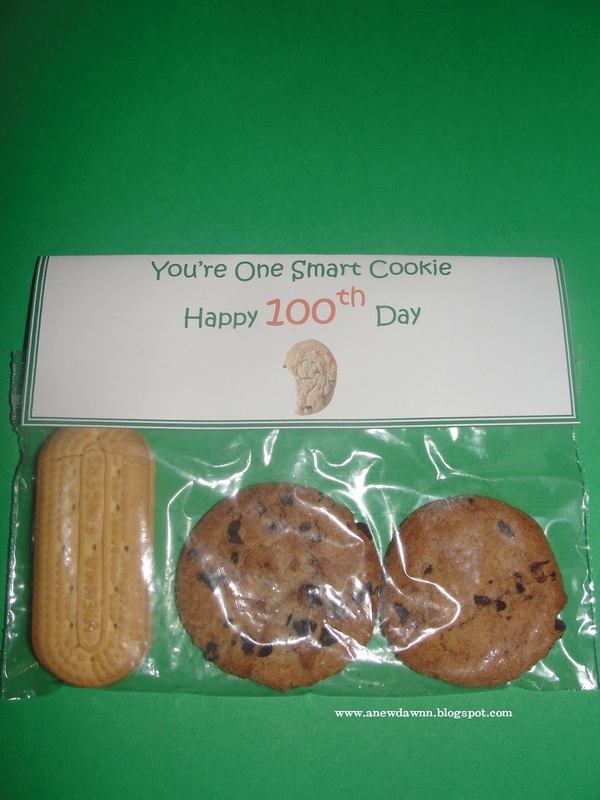 I printed up a quick bag topper that said “You’re a Smart Cookie Happy 100th Day” and attached it to the tops of the bags and that was it. 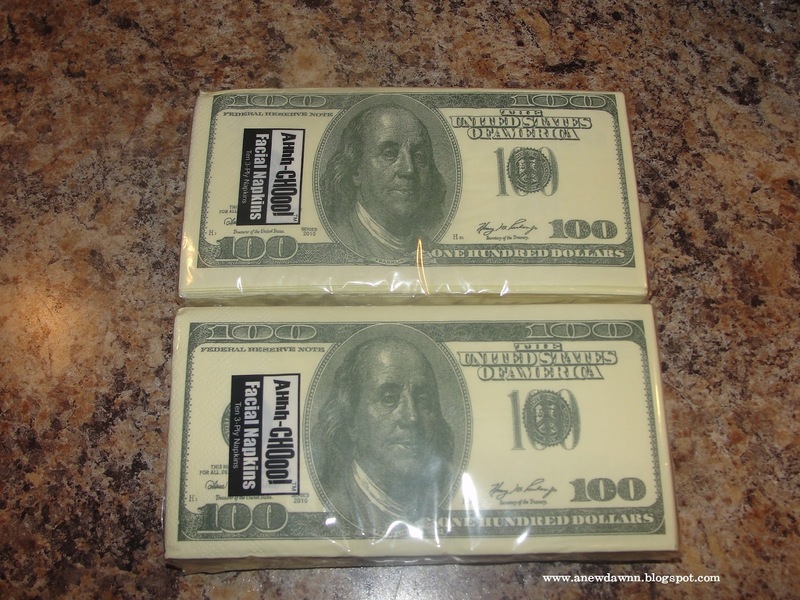 I found these napkins at the grocery store and thought they would be perfect for the day…..
﻿Hope you enjoyed our 100 day snack!! Our school will be celebrating their 100 Day of School this Friday. Each child had to make something or bring in something with 100 things. My son is big into Angry Birds right now so he made a poster with 100 Angry Bird stickers on it….sadly I forgot to take a picture of it. It was cute but he wanted to make something else with all the googly eyes we have so we decided to make a 100 eyed monster shirt. I bought a plain red shirt from Michaels for $3.00, a tube of black puffy fabric paint and a bag of googly eyes from the dollar store…for you guessed it $1.00…. so this little project was only $5.00 to make. Not too bad for a cute shirt. ﻿He drew the outline of the monsters face and teeth in pencil on the shirt so we knew where to position the eyes then we just hot glued all the eyes on. Once all the eyes where on, he traced the outline with the black puffy paint and that’s it! Really simple to make and it only took about an hour to do. He can’t wait to wear it to school!! So this year my son wanted a Ninjago party for his birthday. We decided on having it a local karate studio but since you can’t buy Ninjago themed party supplies I started looking around the internet for ideas to help plan this party. There are plenty of great ideas out there for Ninjago parties that I found by surfing the internet or looking on Pinterest…..here are some of the ideas we went with. First….I’ll start with the favors. I knew I wanted to use chinese take out containers for the favors…..I thought that would be just too cute and I really loved how they came out. I found all the images doing a Google search for Ninjago and found the ones I like the best and went with those. Then I personalized them with “Ninja ______” to give them a more personal feel. I just opened the image in paint and then added the text. I also personalized the little treat bag toppers that went inside each box. Each box contained a little treat bag with some candy, a fortune cookie and these Lego Ninjago sets I picked up a Target on clearance a few months ago! I made the bag topper in Excel and sized it to the size I needed for the bags and then just inserted the image. Some of the images I saved I printed on label paper and cut out using a circle punch and stuck them to the sides of the boxes. Next, I made personalized water bottle labels. I used the same images I had saved from earlier and just added the text….. I also stuck some of the printed circles I used on the boxes to the juice boxes to spruce them up a bit! Next up I made Ninjago pops….all the kids seemed to LOVE these!! ﻿These were pretty easy to make. I just took a tootsie pop and covered it in black or red crepe paper from the dollar store, then I cut out the Ninjago eyes from some of the images I saved and glued them on. Very easy and very cute!! Lastly, I made a cupcake stand from trays from the dollar store, more crepe paper and a Sensei Wu topper. All in all …I loved how everything turned out and the birthday boy couldn’t have been happier with everything and that made me one happy momma! !